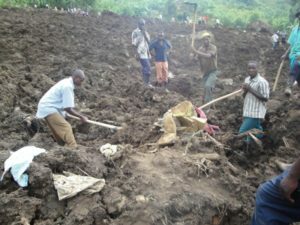 Locals dig through the rubble in search for missing relatives following the mudslide that ravaged Sironko district recently. Courtesy photo. The State minister for Water and Environment Dr Mary Gorreti Kitutu, has challenged leaders in the disaster-stricken areas of Bugisu sub-region not to forcefully relocate mudslide victims to places they do not want. “Stop hoodwinking people that the only compulsory places are either Kiryandongo or Bulambuli,” the minister said. The minister was speaking at the closure of a workshop aimed at sensitising locals about the challenges facing the region at Mt Elgon Hotel last week. The workshop was organised by the Ministry of Water and Environment. Kitutu, also Woman MP for Manafwa district, urged fellow leaders to consider several plausible and pragmatic options as they uphold the international law on human rights. “Let’s look at all options while respecting the international law on human rights that bars the use of force,” Kitutu asked Bugisu leaders. The minister suggested that persons affected by the weather vagaries get integrated into other communities where they can engage in other productive ventures besides agriculture. “They can go to Lwakhakha and open shops, why do you force them to always go to Bulambuli,” the Minister wondered. She also disclosed that there were intentions by the government to set up an enormous market in Lwakhakha to ignite great businesses at Uganda’s border with Kenya.